Students must be recommended by a teacher. Students, parents and recommending teacher need to work together to complete the application. Please make sure to give yourself enough lead time when preparing it. 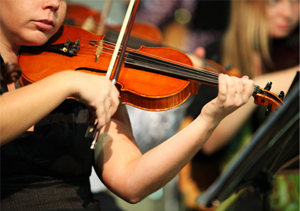 Scholarships provide private lessons to selected instrumental and vocal students. Selected students receive 25 half-hour private music lessons with some of Milwaukee's finest music teachers. As a culminating experience to the program, there is a year-end recital showcasing each participant in a solo performance in front of a live audience. Year 1 students who are recommended by their private teachers are eligible to apply for Year 2. And Year 2 students who are recommended by their private teachers are eligible to apply for Year 3. This workshop is offered at no charge to all students who are auditioning for a private lesson scholarship. And, of course, parents/guardians are welcome! Learn some insights about practicing and performing from someone who has lots of experience with both!